Photos by Rachel Von | The Journal Gazette Aleena York and Colin Christenson of Blue Pluto perform during a recent rehearsal at Sweetwater Sound. Blue Pluto, from left, Sam Bellavance, Colin Christenson, Aleena York and Ethan Radke have performed at weddings, private parties and Club Soda. Sean Nolan is not pictured. Rachel Von | The Journal Gazette Portrait of the band Blue Pluto from left: Colin Christenson, Sam Bellavance, Aleena York, and Ethan Radke during a rehearsal at Sweetwater Sound. 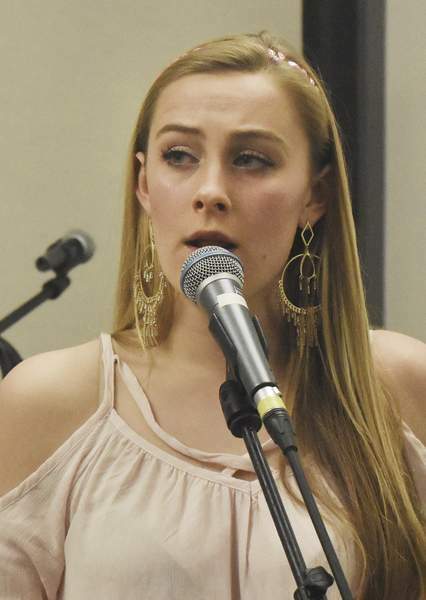 Rachel Von | The Journal Gazette Aleena York of the band Blue Pluto sings during a rehearsal at Sweetwater Sound. Rachel Von | The Journal Gazette Colin Christenson, drums, performs with Blue Pluto during a rehearsal at Sweetwater Sound. 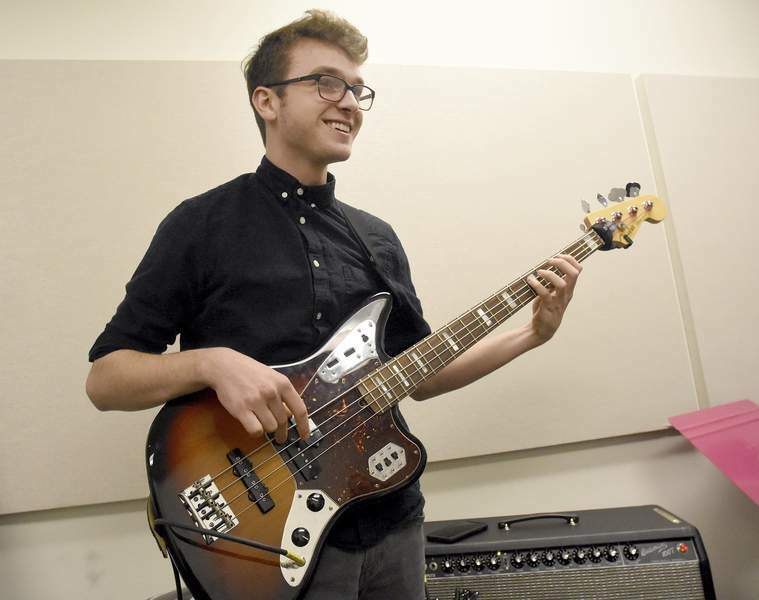 Bassist Sam Bellavance, 16, joined Blue Pluto when the group expanded from three to five members. Where: Club Soda, 235 E. Superior St. The members of Blue Pluto are balancing the life of being a teenager and a musician. With members still in high school and college, the band is taking on the challenge of maintaining time for work, studying, friends, family and performances. 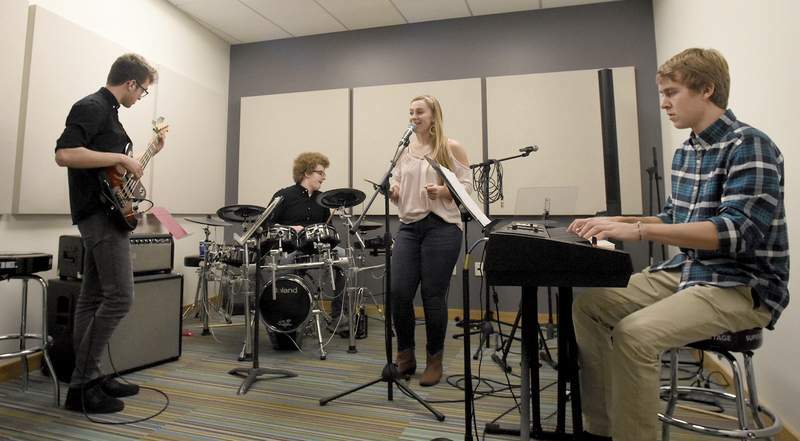 Blue Pluto is a local jazz fusion band of five teens, who play everything from rock to swing to jazz, mixed with pop, southern gospel and country roots. 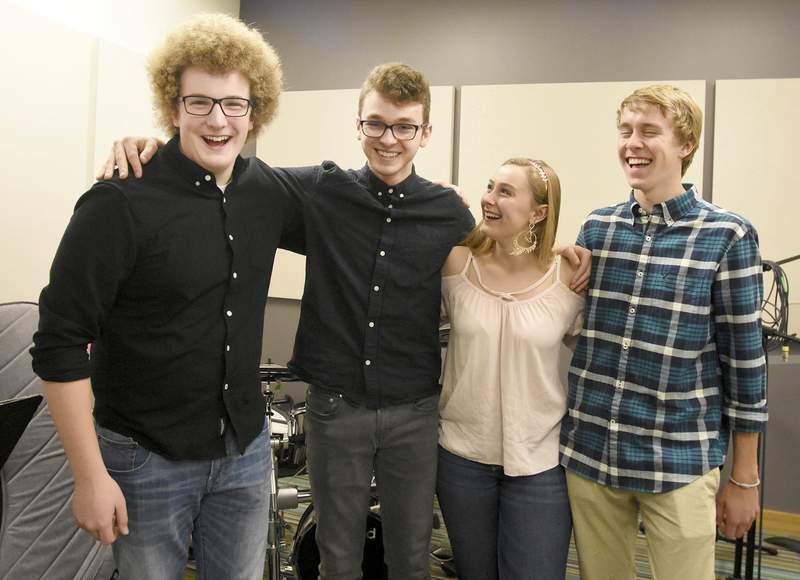 The band was formed in 2014 with three original members – Colin Christenson, 16, on drums; Sean Nolan, 17, on trombone; and Ethan Radke, 18, on piano. The three friends via the Sweetwater Academy of Music were approached by Eric Clancy, a keys teacher at the academy. 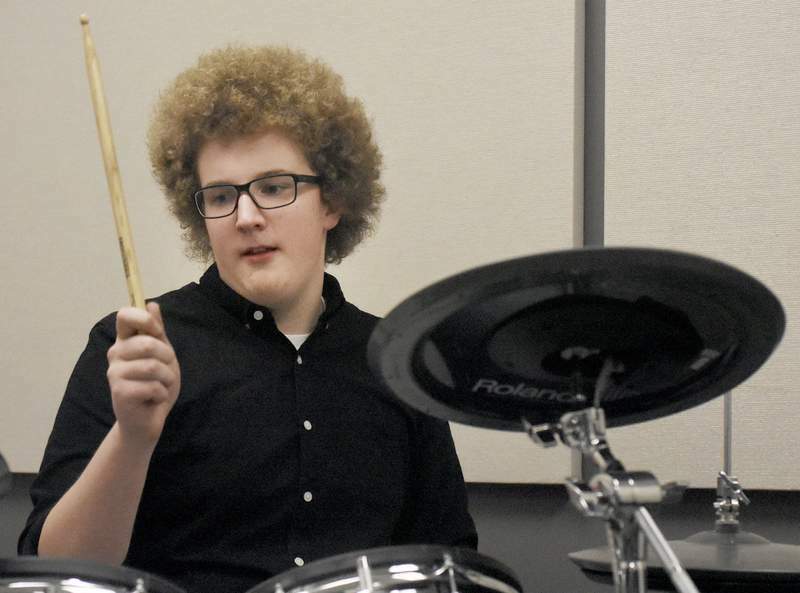 Clancy, 47, suggested creating a jazz band through Sweetwater's “Build a Band” program, where he would be their mentor and teach them how to be a band. Though none of them had a jazz background, Clancy took the chance. “(I said) let's try jazz with these guys and see where it goes,” Clancy says. 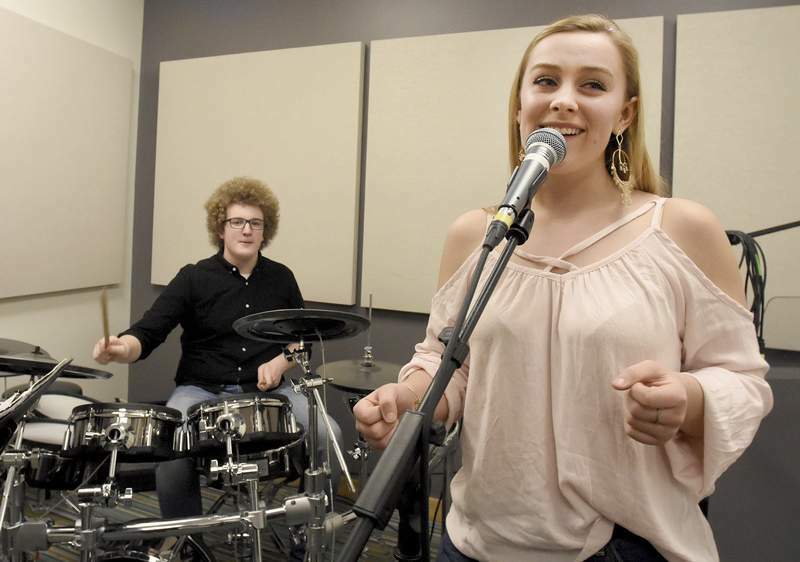 Within a year, the group grew to five with the addition of Sam Bellavance, 16, on bass and Aleena York, 19, as vocalist. Nameless for the first year and half of the band's existence, the group finally landed on Blue Pluto. It is a name created by York as she drove back from a road trip. Though random, it fit – blue, resembling jazz; Pluto, a symbol of the weird, oddity of jazz music. Starting with little-to-no knowledge of jazz and all with a primarily rock-focused background, the group has grown in skill together. They now perform gigs for various occasions and venues, such as Club Soda, weddings or private parties. Clancy oversees booking at Club Soda, and although he is their mentor, he doesn't hire them for that reason. “I wouldn't hire them unless they could (do it),” he says. Of all the bands Clancy has taught or mentored, this group is unique, he says. A year ago, the band was playing mostly swing and standards, or the sets of songs that are generally played in different performance settings. As swing music began to come with ease, members decided they wanted to challenge themselves and explore the world of jazz fusion, which Clancy describes as playing with versatility, improvisation and listening to the others. Jazz fusion has much more rhythmic complexity than swing and standards. Jazz is known for improvising while performing, and jazz fusion puts a twist on it and fuses other genres into it, making a unique stage for creative freedom while being attentive to each other to make it successful. So far, band members haven't viewed rehearsing and performing as burdensome, despite everything else that is going on in their lives. “In my mind, being in the band (is) not as much a job, because I love it,” York says. The University of Saint Francis sophomore says the extra work is worth it. But performing jazz wasn't a first choice for everyone. “At the beginning I hated jazz, honestly,” Christenson says. For him, coming from a rock background where there was a set list and way of making music, the 80 percent improvisation of jazz was intimidating. Now, improvisation is what keeps members in Blue Pluto. Sometimes it fails, but that's what makes jazz unique. “(It has) the potential to be so awful, so it's so wonderful when it works,” Clancy says. Although they are a professional band, the members' youth has created some hurdles in their advancement in the music community. Clancy's goal is for the band to be self-sufficient, which he says they've reached. Band members say they owe it all to Clancy, a professional jazz pianist who has been playing locally for almost 25 years. Clancy helped get their foot in the door for performances and aided in building their reputation and credibility, members say. And as Clancy takes more of a background role, the band works to refine and mature their talent.